First of all, I’ve got really good news. If you’re looking to buy really fast car you don’t have a lot of money to spend, you’re in luck. Thanks to the plethora of brand new cars on the market with over 500 hp, used lots are filling up fast with bargain priced cars with the kind of brutal acceleration that’ll rip your face off. And if you’re willing to buy something at least 15 to 20 years old, it’s extremely easy to find all kinds of cheap fast cars under $5000 without having to look too hard. The first angle is buying a car that’s already fast. A car that you won’t have to do anything to other than keeping it maintained. The other angle is buying a car that’s somewhat fast and then making it faster yourself. That’s obviously not going to be the choice for everybody, but if you’re good with a wrench (or at least have a desire to learn), It’s likely going to be the best bang for your buck. This generation of Mustang (technically known as the SN95) is by far and away my number one pick for a cheap fast car under $5000. They made incredible number of these things, and many of them are still on the road today. Even though it’s a mid 90s American car, it’s one of the most reliable and easiest to maintain. My old 1997 Mustang GT. The purest definition of “fast and cheap”. 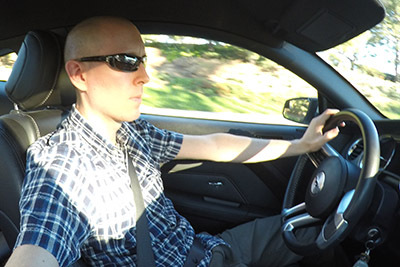 One of the best things about the mustang GT is the fact that it’s already (fairly) fast in completely stock form. However, with just a few minor modifications (such as in underdrive pulley, tuning chip, and intake), the car can be transformed into a monster without sacrificing reliability. For the record, I’ve owned two of these already (a 1996 and a 1997), and both were purchased for far less than $5000 each. I never had a problem with either one, and I enjoyed them so much that I suspect that I’ll be buying another one eventually. It’s not a perfect car by any means, but it’s definitely cheap and fast. OK, yes, I realize that this is a fairly obnoxious pick for a cheap fast car under $5000. However, when you think about what it really is, you have to agree that it would be foolish not to include it on this list. No matter that it may be a reliability nightmare – because a big V-8 in the small car like a Miata is hellishly good fun. Just check this out. There are two ways to go about getting a Miata with a V-8. Easiest way of course is to buy one that has already had the conversion done to it. The problem with doing that is the fact that it might cost more than $5000 depending on its condition. The other problem is that it’s likely to be the worst car you’ve ever owned because of all of the maintenance and upkeep it’s going to require. But come on – a V8 in a Miata? That’s got to be worth some kind of risk, right? You could likely do the conversion yourself for under $5000 if you’re good with working on cars. It’s an incredible time investment though so you have to weigh that into consideration. But wow…a V8 in a Miata! If you can get over the fact that the crown Victoria is a hellishly large vehicle that won’t corner worth anything, it’s likely to be one of the cheapest and fastest cars you can get for under $5000. Used police cars are notoriously cheap for a reason. They’ve always got a ton of miles on them, and they’ve been beat to heck and back. However, the crown Victoria was incredibly reliable vehicle – especially in it’s later years. The reason why it was such a popular one with police forces all across the US is because of how bullet proof it was (figuratively not literally). There’s nothing more demanding on the car then being use daily as a law-enforcement vehicle, and the crown Victorias held up well. The nice thing about the crown Victoria with the police interceptor package is the fact that it came with the same V8 that can be found in the Mustang GT and full-size trucks. This means that modifications are incredibly cheap and easy. Why am I telling you this? So that I can let you know that I remember what it was like to be young and dead broke. I remember scouring through used car lots in classified ads in my late teens and early 20s searching for the hottest cars I could find for the least amount of money. I remember what that kind of desire felt like. It was incredibly intense, and I wanted nothing more than to rid myself of my 1983 Pontiac 6000 and get behind the wheel of something ridiculously fast. And cheap. Unfortunately, when desire for a cheap car becomes as strong as that, bad decisions are likely to happen. When looking for cheap fast cars under $5000, you’re going to have to wade through a lot of really bad cars that shouldn’t even be on the road to begin with. More importantly, going to have to learn to control your emotions and identify a bad car when you see one. Just because it’s cheap and fast doesn’t mean that it’s something you should buy. When in doubt, bring a friend along who has no skin in the game to keep you in check. After all, the last thing you want to do is spend $5000 in the car only to have to keep pouring thousands more into it just to keep it running. When you’ve got a burning desire to buy an insanely fast car and only $5000 to spend, it’s not uncommon for logic and reason to be pushed aside like an annoying task at work that has no due date. I know this, because I’ve been there. I remember being 16 years old looking through the inventory of the local junkyard trying to find a fun car with a blown engine that I could fix myself. Keep in mind that I barely knew how to change the brake pads on my bike, so saying that I was in over my head is an understatement. Sometimes the cheapest isn’t always the best. As a matter fact, it’s likely always going to be the worst. Finding a cheap fast car that’s cheap because it has “issues” is something you don’t want to deal with. Period. Even for an experienced mechanic, the hassles maintaining problematic car is going to get old really fast. I also highly advise against being lured into the temptation of buying a used BMW or Mercedes with a price tag that seems far too good to be true. 15 to 20-year-old European cars will absolutely destroy your bank account – if it isn’t in bad shape already. The reason why BMWs and Mercedes sell so cheaply on the secondhand market is because maintenance and repair costs are insane. Tempted by an older BMW? Do yourself a favor and forget it ASAP. It’s not worth it! I’m not going to lie when I say that I’ve been tempted by $5000 BMW M3’s before. However, that temptation dissolved instantly once friends told me horror stories about $10,000 repair bills they’ve had to deal with for their own BMWs of similar vintage. In cases like this you need to do the research necessary to make sure you don’t buy your way into complete financial ruin. It will happen if you’re not careful! Here in the US, it’s not all that difficult to find cheap fast cars under $5000. Your best chances for getting a good deal is to buy privately. Stay way from professional used car dealers! Professional car sales A lot of overhead, and therefore you will be paying quite a bit extra so the dealer can make a profit after he pays his own bills. When dealing with cars costing $5000 or less, your best bang for the buck is by far to buy from a private seller. I’ve always had really good luck with craigslist, though you do have to be careful since there are a lot of untrustworthy people out there looking to unload extremely problematic cars. If you know what to look for when identifying potential cars you want to purchase (worn brakes, leaky gaskets, etc. ), you’ll do all right. If you don’t know what to look for, bring a friend who’s good with that kind of stuff. Dedicated used car websites aren’t very good for finding cheap cars in my opinion. Sites like AutoTrader and cars.com tend to Focus mid to high priced used cars rather than the budget stuff. Of course it doesn’t hurt to have a quick look around, but your best bet is going to be craigslist for your local area. Speaking of local areas, that plays a very important role in finding cheap fast cars under $5000. For example, where I live in Southern California, used car prices are generally 10 to 20% higher than they are in other parts of the United States. It’s just one of the many curses of living in such a beautiful area I guess, but if I were looking to get the best deal possible I would look out of state. Beware of transfer fees though! Transporting a card from one location to another thousands of miles away can get expensive. Fast. And then there are DMV fees you’ll have to deal with, so definitely consider that before broadening your search. Is buying a really cheap fast car worth it? Yes, it is worth it if you do the research and by the right car. Both SN95 Mustang GT‘s that I bought in the past were obtained for less than $5000 each and ended up being incredibly reliable. I daily drove both for more than 2 1/2 years each, and I feel really good (and proud) about the fact that I took the time to do the research before buying. It most certainly ended up paying off in the long run! However, I’ve had plenty of friends over the years finding themselves stuck with cheap fast cars under $5000 that were total nightmares. In each of these cases, it was usually because it was an impulse purchase done without any proper research. Just because it’s cheap and fast doesn’t mean it’s worth buying. You enjoy working on cars, right? Because it’s pretty much required when you buy something fast and cheap (unless you get lucky like I did). Your best bet for getting reliable car is to buy one that is completely stock and has never been modified. Trouble grows exponentially with each modification you make, and if you buy a car that’s already been heavily modified, you’re very likely buying someone else’s problems. In that case, it’s not worth it and it behooves you to keep looking. The bottom line is that it *is* entirely possible to have a lot of fun with a really fast car for under $5000. It’s not as easy as it may seem though, because when it comes to cars, cheaper usually always means “more problems”. As long as you know that and are prepared to deal with the consequences, it has the potential to be one of the best purchases you’ll ever make. My own two sub-$5000 car purchases over the years were probably my most memorable. The brand new 350Z I bought in 2004 and the used 2012 Mustang GT I bought in 2016 were very fun. Of course they were! But nothing says “fun” like a $5000 car that you can beat on and drive hard knowing that it’s not a delicate and precious gem. Even if I would’ve had some minor problems with them, I still would’ve been very happy with the purchases. Why? Because I bought both knowing full well that trouble usually comes with cars this cheap and I was kind of looking for a challenge. Thankfully those two cars didn’t give me much of a challenge, but at least I was prepared for it. And as long as you feel the same, you’re going to have a total blast with your sub-$5000 cheap fast car.